It is difficult to estimate how much companies spend on new rack equipment every year. One of the biggest causes of new rack purchases has to do with damage caused by human error, rather than expansion or upgrades. Warehouse management has a big impact on how often you encounter rack problems. Here are some important tips to keep in mind for preventing rack damage. The most important element of preventing rack damage is proper training for your personnel. Forklift drivers should have plenty of practice driving their lifts. In addition, your team members working on foot need to be trained on proper movements around lifts to keep from catching your drivers off guard. You should institute speed limits in your aisles, hand signals, and even directional lanes where necessary to keep everyone safe. 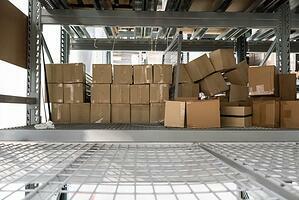 There are many safety measures that can be put in place throughout your warehouse. Mirrors at the end of every aisle can help drivers and workers on foot gain visibility around corners. Skimping on these simple safety features can increase the probability of rack damage. Making safety a priority will pay off for more than just your rack equipment. Countless accidents occur each year as a result of traffic jams in the warehouse. People trying to squeeze by one another or working in between moving forklifts often causes unnecessary accidents. With the help of a proper warehouse management system, you can reduce the amount of traffic in your aisles by allowing the software to route your team members more effectively. One of the less talked about elements of preventing rack damage is limiting the number of times that your team members need to touch and move products. Your warehouse management system should include features such as direct to pick, which keeps products from moving from one rack to the next unnecessarily. Any product that can go straight from the receiving dock to your picking team will cut the chances of any accidents occurring. Rack damage is a problem that every warehouse faces, but with the help of quality warehouse management, you can limit your expenditures on rack equipment. Your warehouse management software can provide you with all the guidance your team needs to minimize traffic, minimize product touches and simplify movements. Make sure that you are supplementing your warehouse management system with ongoing training and safety precautions.